There is something wonderful about the rustic charm wood beams bring to a room. The cost of solid wood beams can quickly add up though! With faux beams you can capture the look without the hefty price tag. Pre-made, faux beams are available for purchase, but you can also construct your own out of wood planks. Building your own beams gives you complete control over the size, color, and material, and, depending on the type of wood used, can be a very affordable alternative to purchasing ready made ones. The construction itself is fairly simple, too. Three planks of wood are fastened together with nails and glue to form a “U” shape. If you wish, you can inset the bottom of the “U” by placing shims under the board to raise it up a little. Raising up the board will create a shadow along the bottom of the beam that will add further visual interest when installed on the ceiling. Once you figure out the placement and quantity of beams needed, you will need to install nailer boards. Attach them directly to the ceiling spaced every 3-6 feet along where your beams will hang. It is best to locate studs when hanging these boards so that they can support the weight of the beams. The hollow cavity of the beam will fit around the board and be affixed to it rather than the ceiling. Finally, fill any gaps or nail holes, sand, and stain or paint in your color of choice. Then step back and enjoy you beautiful new beams! Beams create a visually pleasing rhythm in this hallway. ‍Photo by Morgan-Keefe Builders, Inc. The cathedral ceiling is highlighted by beams that follow its steep-pitched lines. Beams become the star in an otherwise neutral space. Let Us Transform Your Home With Faux Beams! Did you know that part of our carpentry services include constructing and installing faux beams? These homeowners were looking to add visual interest to their existing home, and faux beams distressed and stained a dark espresso, coupled with square columns and built-in bookshelves, were the perfect solution! 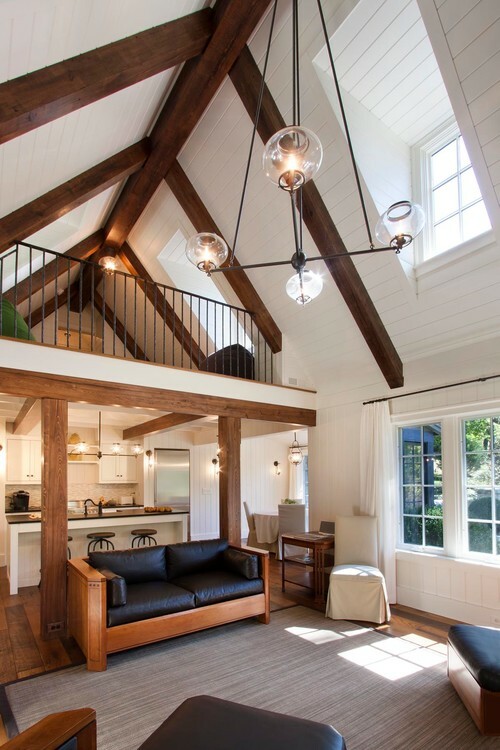 We love how the beams help to unify the open floor plan, while creating distinct living areas. Are you interested in adding rustic charm to your Bend, OR home? Give us a call today to find out how we can turn a ceiling in your home into a fantastic focal point!